The RESTOP® 1 four-pack contains 4 disposable urine bags. Each bag contains super absorbent polymers and enzymes that will absorb a full 20 ounces of urine. The wide opening with semi-rigid rim allows for easy use by men or women. The one-way valve prevents spillage should the used bag be accidentally dropped. RESTOP contains the odor as well as the waste. Deodorants are added to the polymers to eliminate odors. The RESTOP 1 is a quick, convenient and environmentally friendly way to answer natures call. 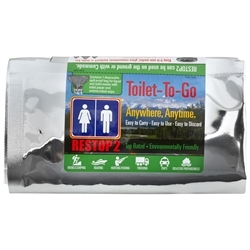 When you're out and about and can't get to a restroom, make sure you are equipped with our stuff...we're RESTOP. We provide totally mobile and disposable restroom products that are so lightweight they can be carried by anyone. Disposal is easy - just drop it in any trash container. Where to go when there's nowhere to go. For everyday use or just for emergencies. Carry it in your pocket, glove compartment, tackle box or back pack. The travel toilet that goes where you go. Contains: 4 spillproof bags for liquide waste (urine or vomit). Toilet paper and antiseptic wipes included.